This bundle includes essential items to upgrade the steering system on your RXP-X 260/300. Includes our race proven billet steering system along with precision machined aluminum housings for your IBR triggers and switches. Replaces the original plastic steering system and bulky OEM switches with bullet proof components and cutting edge styling. Compatible with standard MX style bars and grips. RIVA Sea-Doo RXP-X 260/300 Pro-Series Steering System- The ultimate race proven steering system for your Sea-Doo RXP-X 260/300! Steering shaft is constructed of aircraft grade aluminum tubing for maximum strength & rigidity. Directly replaces plastic system with a stronger unit that provides variable tilt positions. Delivers a precision feel and the confidence to push your craft to the limit with improved dependability and comfort. Bulletproof bar clamp will accept any 7/8” handlebar. Includes all necessary installation hardware and instructions. RIVA Sea-Doo Electronic Throttle Lever Assembly- This billet electronic throttle housing utilizes OEM electronic actuators. Mounts to a variety of aftermarket 7/8″ handle bars. Utilizes OEM electronic actuator which drops into our new housing for OEM electronic trigger operation. Fits all Sea-Doo models with iTC (Intelligent Throttle Control). Clamp on Handle bar design allows for adjustability of throttle position and angle. RIVA Sea-Doo Electronic IBR Lever Assembly- This billet iBR trigger housing utilizes OEM electronic actuators. 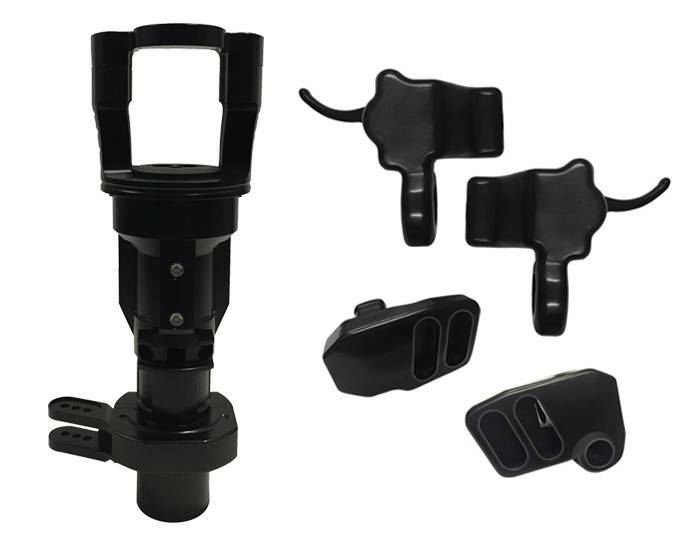 Mounts to a variety of aftermarket 7/8″ handle bars. Fits all Sea-Doo models with iBR (Intelligent Brake & Reverse). Clamp on Handle bar design allows for adjustability of iBR trigger position and angle. RIVA Sea-Doo Electronic Control Switch Housing Right- This Billet iBR/iTC Switch housing mounts to a variety of 7/8″ aftermarket handlebars when combined with our Steering Systems. OEM switches drop into housing with no modifications. RIVA Sea-Doo Electronic Control Switch Housing Left- This Billet iBR/iTC Switch housing mounts to a variety of 7/8″ aftermarket handlebars when combined with our Steering Systems.